I arrived at KJLY January 1st, of 2006. I believe it was the hand of God that opened the door to grant me the desire of my heart, to return to full time Christian Radio Ministry. I feel that these last eleven years at KJLY have been some of the most exciting years of my ministry. I love following the leading of the Lord, and being a part of the tapestry that the Lord would weave through KJLY’s broadcast ministry. It has also been my privilege to travel to various Churches in the listening area, singing and sharing my passion for this Christian Radio Ministry, and how God uses us to bless the listeners. By way of introduction, I was born at an Air Force base in Puerto Rico and was raised in Northeastern Ohio between Akron and Cleveland. I accepted the Lord as my Savior in my sophomore year of high school. I graduated from high school in 1973 and received a call into full time ministry. I attended North Central University in Minneapolis. It was at North Central where I met my wife, Jan (from Granton, Wisconsin) and was later married in May of 1975. 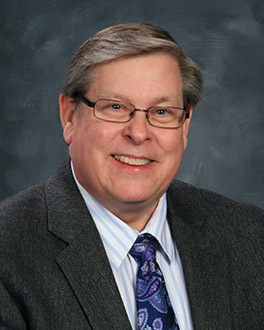 Since leaving college in January of 1978, I have served as an associate pastor in 4 churches (Neillsville, WI – Rochelle, IL – Carlinville, IL – and Rochester, MN) was a senior pastor in 2 churches (Gibson City, IL and Red Wing, MN) and have served at 3 Christian Radio stations as an on-air announcer, music director, program director or station manager (WQFL – Rockford, IL, WBGL – Champaign, IL, and WIBI – Carlinville, IL). I have also traveled to various churches in the listening area doing Radio Rallies, preaching, singing and fund raising. We have two grown children – Kevin and Kelly. Both are graduates of Dover-Eyota High School in Minnesota and the Rockford Master’s Commission Discipleship program in Illinois. My son works in the mail department at Mayo Clinic in Rochester, MN., and my daughter is para-professional at Kasson Mantorville Schools. We also have a beautiful Golden Retriever named Cooper. I love sports. I am a Cleveland Sports fanatic – Indians #1, then Browns and Cavaliers. It is very therapeutic for me to attend as many games as possible. I also enjoy all the Minnesota sports teams. My wife, Jan loves music, playing flute and piano, reading and doing crafts. I thank the Lord for KJLY, and for how He uses the station to make an impact on lives of people each and every day.